A multilingual scholar-practitioner with over 15 years of experience working in Burundi, the Democratic Republic of Congo (DRC), Afghanistan, France, and the USA, Dr. Tina Robiolle has expertise in designing, managing, and facilitating research and capacity-building programs. She has also been teaching negotiation, conflict management, and mediation as a senior lecturer for the past 18 years. A graduate from ESSEC Business School, Tina Robiolle also holds a PhD in international relations from the Fletcher School of Law and Diplomacy (Tufts University). Since 2001, she has worked as an independent consultant and facilitator for various organizations, including the Wilson Center in DC, UNESCO, HD Center for Humanitarian Dialogue (evaluation of their projects in Libya and in Syria), the Inclusive Peace and Transition Initiative, UN Women, and UNITAR. 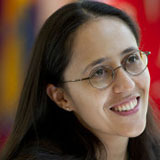 In this capacity, she has conducted research studies, evaluation missions, and developed and facilitated peace building and conflict transformation programs for Government officials, members of the Parliament, UN military observers, leaders of the political parties, the High Command of the Army and the National Police. Parts of this work included the design and testing of a conflict resolution training program targeting secondary schools and endorsed by the Ministry of Education of Burundi. This successful project led her to develop a doctoral dissertation at the Fletcher School on the topic of peace education policies and programs in fragile states with a focus on the case of Afghanistan. Interested in giving back to her native region and in the role of women in peace processes, she has also developed a capacity-building program for Afghan women parliamentarians with the objective to strengthen and promote the political participation of women in Afghanistan.